Dhabas have been an integral part of any North Indian foodie's life, couple it with someone whose friends are bitten by the travelling bug. Apart from childhood memories of travelling with family to Punjab, Rajasthan and the hills, the distinct memories of eating at dhabas are shared with Puneet and Vivek on various road trips. Getting an invite from Paranda at Taj Vivanta, Surajkund positioned as speciality Indian Restaurant had me wondering why would I want to eat Dhaba food at a 5 star. Went along with the flow to see what they had to offer. The decor set the mood just right. Vibrant colours in matkas leading up the staircase. A lifesize truck with colourful sayings, very characteristic of the highways. The lift doors cleverly built in with bright green wooden doors like those of a village home. Paranda is a hair accesory in Punjab, a kind of tasselled tag for braiding hair. How could I resist being my crazy self with my friends Mukta(also kindly agreed to share her pictures for this post), Rekha and her lovely daughter Agreya. The theme of highways and villages is carried forward in every bit of the decor superbly built-in to blend yet stand out. Charpoys, lanterns, martaban, brass utensils(all sizes of pots and pans), parandas, dupattas, bangles, old radio sets, traditional jewellery. The place is a photographers delight. We were welcomed by the staff, Chef Ganesh Joshi and the GM Mr. Rajeev Khanna. 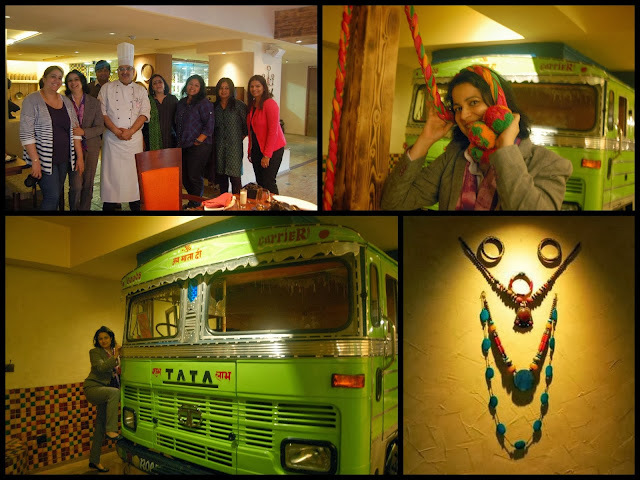 Chef Joshi introduced us to the concept of the restaurant. 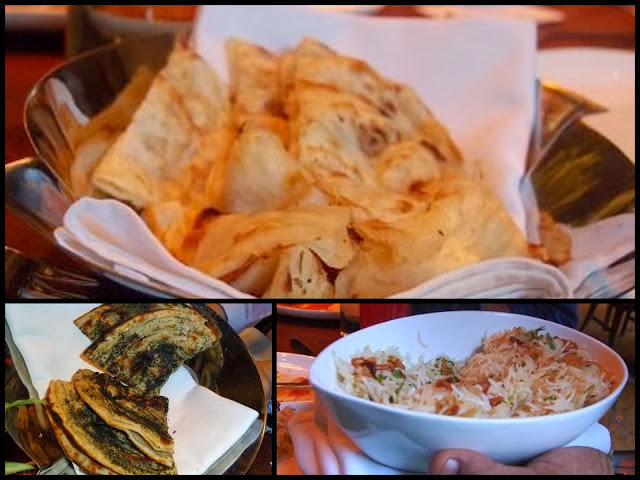 The menu features an abundance of robust, earthy dishes that have evolved from the province of Punj (five) Ab (water) – The Land Of Five Rivers. 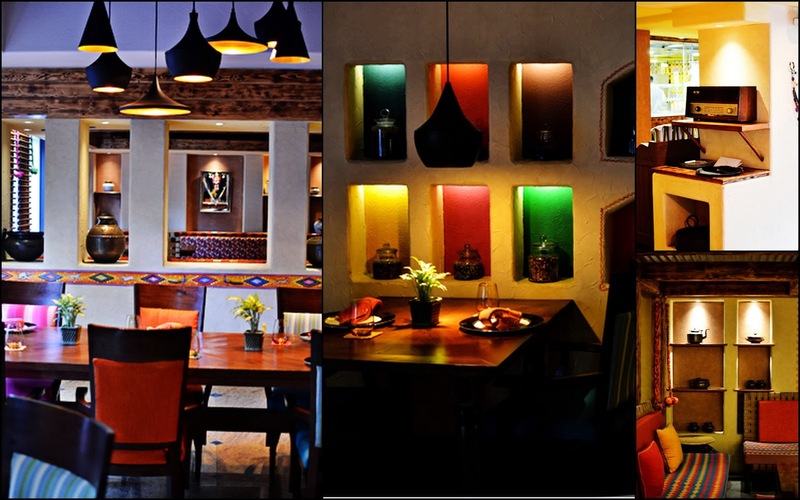 From the ingenuity of the ingredient to the flawlessness of the execution, every aspect of Paranda will lead to an emotive, intense, liberating way of eating with fingers unlike any other says Chef Joshi. 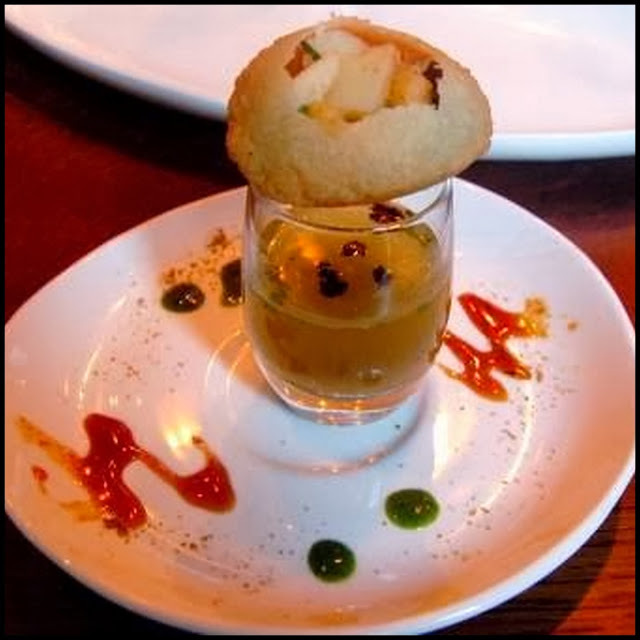 An interesting amuse of golgappa stuffed with potato, chickpea and sweet tamarind chutney led me to believe that this food journey would surely be rewarding. Yes, I got seconds. Am never the one to pass up good golgappas. The Magan Murg Shorba however was a disappointment as it was too salty. Not something expected at such a place. Some murmurs had the soup instantly replaced. The starters were a Platter of Methi Achari Tikka, Murgh Sunheri Shahi Tikka and Bhutta Malai Jhinga with baby Khasta Roti. 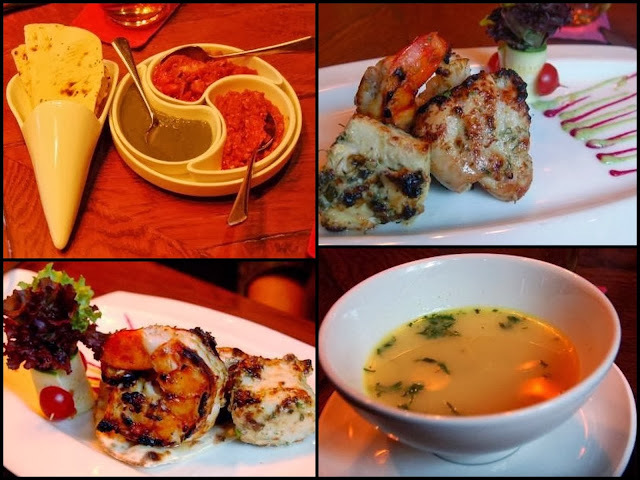 The chicken was soft and succulent, fish was flaky and the prawns were flavoured well and my favourite out of the lot. We were served a unique combination of onions marinated with spiced yogurt. Something I haven't seen at at any Dhaba. It made the onions loose their punch. What we all missed on the table was sliced onions or better still 'Mukki wala Pyaz' where the truckers just smash the onion with their fist. Once pointed out, it was served instantly on the table. This lack of punch was an overall view on the table, best described as 'Food-For-Foreigners'. The main course started with Sood de Dhabey di Dal, Palak Kofta Makhni Wala, served with Pudina Parantha and Namak Mirchi ka Parantha. The dal gets it's name from an eatery in Ferozpur called Sood Da Dhaba. Sec 7 ka Mutton Tariwala, was a take on a local dhaba in sec 7 in ambala. 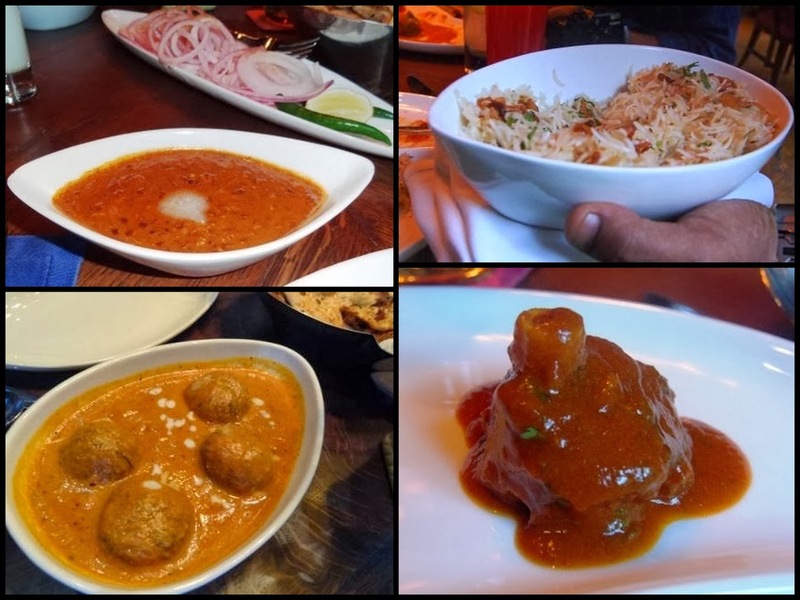 The mutton was cooked very well in a tomato based curry and spices were just right. The Mushroom Mattar was passable. Zeera Pyaz Pulao has a lot of us going hmmmmm, the fried onions and flavours of spices brought out by dollops of Ghee. 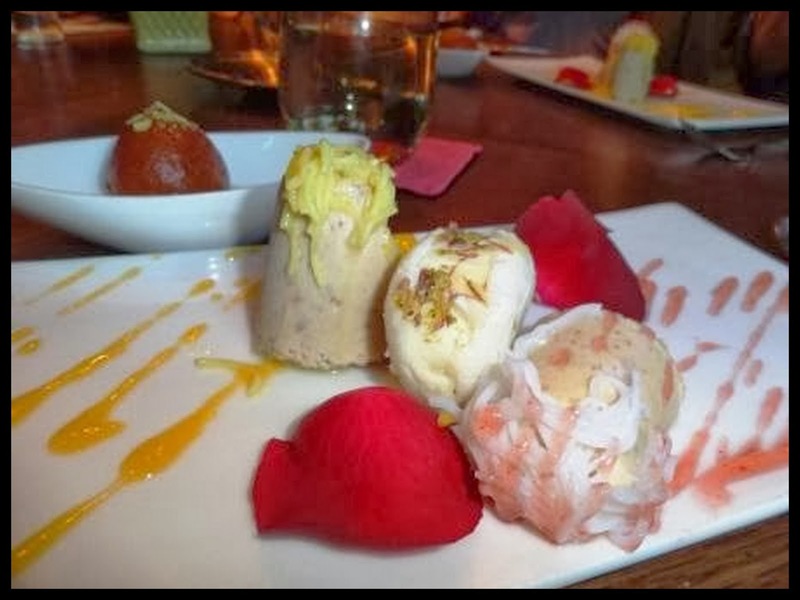 For desserts there were Malai Chamcham, Anjeer ki Kulfi and Gulab Jamun. Despite being stuffed by now, the entire gulab jamun went in. The Malai Chamcham and Anjeer ki Kulfi were nice however Falooda wasn't up my street. The dried paan was an excellent mouth freshener. A huge thank you to Saumya and Nafisa for having us over. Heartfelt thank you to Chef Ganesh Joshi for reaching out to our hearts via our stomachs and wishing his team all the best.